The public will have a unique opportunity to view and have their picture taken with the prestigious Uefa Champions League trophy during an event which will be held on Saturday between 10.30am and 2pm at The Point Shopping Mall in Sliema. 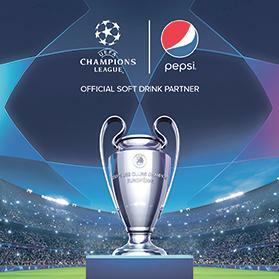 Brought to Malta by Pepsi, the official soft drinks partner of the Uefa Champions League since 2015, the event will also host a surprise appearance by an international footballer and former winner of the Uefa Champions League trophy. Simonds Farsons Cisk plc, bottlers of Pepsi-Cola products in Malta, have recently commemorated their 40-year partnership with PepsiCo, one of the world’s largest corporations in the global food and beverage industry. Over these years the company has been officially recognised and awarded for the consistent attention to quality which is reflected in the final top-notch quality of the Pepsi-Cola products on the market. The PepsiCo portfolio of foods and beverages is marketed and distributed by Simonds Farsons Cisk plc and Quintano Foods Limited, members of the Farsons Group, and available all over Malta and Gozo.